Interestingly, the language of the 13th Amendment, viewed acontextually, does not foreclose their claim. It states simply that “[n]either slavery nor involuntary servitude, except as a punishment for crime whereof the party shall have been duly convicted, shall exist within the United States, or any place subject to their jurisdiction.” It does not speak of persons or citizens, as do so many other constitutional guarantees, but rather focuses on and prohibits the acts of slavery and involuntary servitude. Moreover, while the Thirteenth Amendment (or at least its prohibition on slavery) was substantially drafted and ratified for the benefit of black Americans in slaveholding states, the text is not limited to any particular group or class. Certainly we have seen other constitutional provisions, such as the guarantees of due process and equal protection, judicially extended well beyond their originally envisioned scope. Does this mean, then, that the orcas’ lawsuit stands a fair chance of prevailing? I highly doubt it. 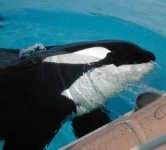 Despite the complaint’s concededly sympathetic recitation of facts concerning the species-specific harms visited upon the orcas in question, the lawsuit appears to face at least two serious potential obstacles. First, while it is true, as alleged, that section 1 of the 13th Amendment has in some instances been described as self-executing (i.e., not needing the medium of a federal enforcement statute), that characterization was often made in particular circumstances at particular points in time and should not today be accorded significant weight. In fact, the bulk of contemporary federal court authority, generally from district courts, suggests that there is normally not a private cause of action to enforce the 13th Amendment. As stated by a district judge in the Southern District of California—the very court where the orcas’ suit has been filed—“[f]ederal courts have held that the Thirteenth Amendment does not give rise to an independent cause of action against private parties; plaintiffs must instead base such claims on one of the statutes implementing the Thirteenth Amendment . . . .” Del Elmer; Zachay v. Metzger, 967 F. Supp. 398, 402 (S.D. Cal. 1997). To be sure, “[n]either the Supreme Court nor the Ninth Circuit nor, for that matter, any circuit at all, has directly addressed this question.” Jane Doe I v. Reddy, No. C 02-05570 WHA, 2003 WL 23893010, *9 (N.D. Cal. Aug 04, 2003). Importantly, the orcas’ suit is filed directly under section 1 of the 13th Amendment and not under one or more federal enforcement statutes authorized by second 2 of that Amendment. While it may be that these statutes are not broad enough to cover all of the harms alleged in the suit, the more likely reason for avoiding the use of the federal statutes is that they, unlike the 13th Amendment, do employ terms like “person” and thus would pose a serious obstacle to would-be plaintiffs, like orcas, that are not persons in any ordinary sense of the word. The second serious obstacle potentially facing the orcas’ lawsuit is that of line-drawing. The judiciary has always experienced unique difficulty defining or delineating rights-bearers under the Constitution, even when the alleged rights-bearers are arguably or even undeniably human beings. To ask courts to venture via the Constitution into the realm of non-human species, which is exactly what the orcas’ lawsuit is asking, will strike many if not most judges as at best unpalatable and at worst improper. It would demand of them entirely new doctrines and analysis, would likely expand their docket immensely, and would embroil them in controversies that, at least in the short run, could cause significant damage to their institutions. Perhaps fifty or one-hundred years from now, constitutional or other legal claims on behalf of non-human beings will be commonplace. At this point in time, however, there is good reason to think that such claims are beyond the capacity of the written law and beyond the capability of courts to handle them with any degree of competence, consistency, and, not least, authority.